den Januar 12, 2016, 2:29 p.m. Since the events of New Year's Eve in Cologne, in which dozens of women were sexually assaulted and robbed by men described as of North African and Arab appearance, the tide has begun to turn against Germany's open-door approach to immigration. Following protests by the right-wing Pegida movement involving fireworks and bottles being thrown at police, Angela Merkel proposed new measures to deny the right of asylum for those who have committed crimes or are on probation – where currently only asylum seekers who have been sentenced to at least three years' imprisonment, and will not be at risk in their countries of origin, are forcibly deported. 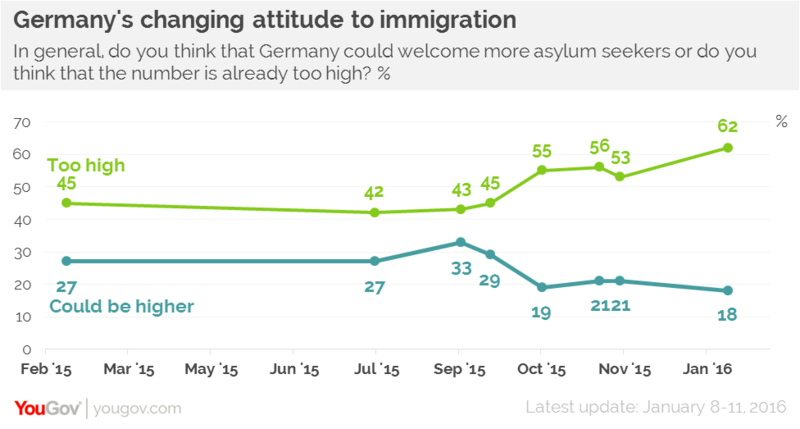 New research by YouGov in Germany for the Bild newspaper reveals a sharp hardening of attitudes to immigration following the attacks in Cologne. On November 20 a slim majority of 53% said the number of asylum seekers in Germany was already too high, however 42% said the current numbers were acceptable (22%) or that Germany could even accept more (21%). Now however, fully 62% say the number of asylum seekers is too high, while only one in three say the current numbers are acceptable (16%) or could be higher (18%). There were also protests by feminist groups in Germany on Saturday, after police in Cologne were criticised for deploying too few officers during the night of the attacks and for issuing an incorrect assessment that the atmosphere in the city was "relaxed". Cologne's Mayor Henriette Reker made matters worse by proposing a "code of conduct" for women, appearing to blame victims by advising women to stay "at arm's length" from strangers. German women are now more likely than men to say the number of asylum seekers in Germany is already too high (63% and 60% respectively) – which had not previously been the case – and the hardening of women's attitudes by 12 points is the main driver for Germany's now-strong resistance to immigration. A report by the interior minister for the region said 19 individuals are currently under investigation in connection with the attacks, including 14 men from Morocco and Algeria. 10 of the suspects are asylum seekers, nine of whom arrived in Germany after September 2015, while the remaining nine are possibly in Germany illegally. The report details how a group of around 1,000 men of North African and Arabic origin gathered on 31 December, forming smaller groups and surrounding women, then threatening and attacking them. "After the intoxication with drugs and alcohol came violence. It culminated in the acting out of fantasies of sexual omnipotence. That must be severely punished", said Mr Jaeger.